Their challenges are well known: they are intensive in capital, complex to run operationally, have lower margins than software, etc. 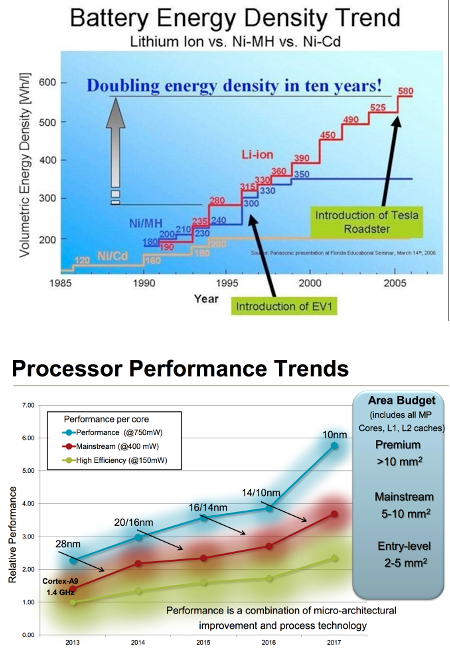 And even if they succeed, hardware tends to be commoditized over the long run which breaks its defensibility. But then, a new wave of hardware startups came solving most of those issues and investors are jumping again into hardware. Drones are attractive today because, basically, they can fly longer and better and are cheaper. And they do that, not surprisingly, mostly because of the progress in technology. On one side, the electric motors and processors are a lot more efficient in terms of energy consumption. On the other side, batteries generate more power per kilo which allows the drones to fly longer. Those processors are also a lot more powerful which allows engineers to do real-time computing to control the flight to make it more stable and easier to control. Additionally, the elements to build a drone are also cheaper and more available thanks to 3D printing and other prototyping tools. Drones are still in their infancy. Therefore, like the computer industry 40 years ago, most of the money is still being invested into the hardware companies that are manufacturing the devices. On the device side, there’s a clear differentiation between industrial-grade drones, professional and personal/consumer oriented products. There’s also an emerging industry of providers of components — cameras, motors, etc. — and software for the drone users and manufacturers — ie. operating systems, autopilots, visual recognition, etc. At the service level, we see the first horizontal platforms that allow the hiring of drones and drone operators — for footage, inspections, etc. and the first ones vertically focused on the needs of industries like agriculture, oil and gas, energy, etc. In the commercial sector, the industries where drones are starting to be used are those where large areas need to be monitored or the access by humans might be complicated — infrastructure, construction, mining, agriculture and oil & gas among other examples. There, we see players who are horizontally focused like Airware (40m$), Precision Hawk (10m$) or others who focus vertically in different industries like Skycatch (40m$) and Kespry (10m$) in construction; Sky Futures in oil and gas; Avetics film and photography, etc. But where larger amounts of drones are being sold is in the personal space. More than 2 million drones are been sold to recreational users per year — and this figure is growing fast. 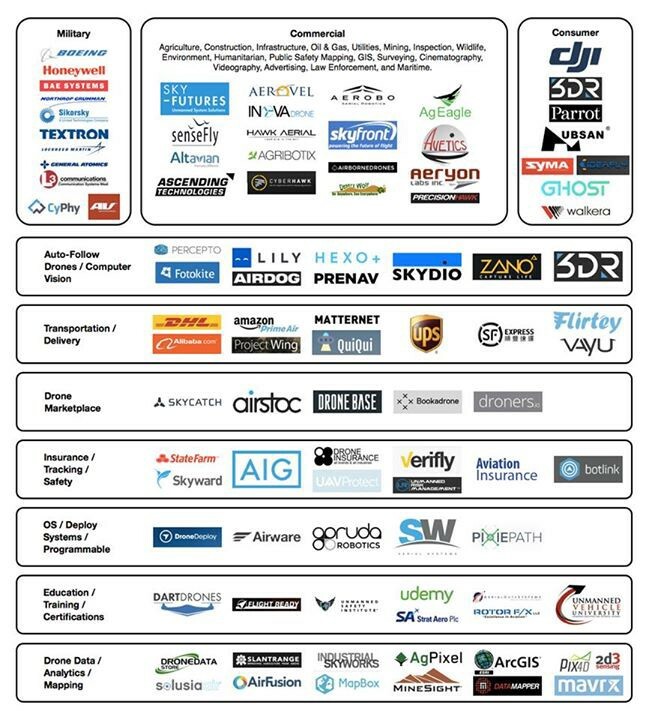 The three largest manufacturers are DJI(100m$), 3DRobotics (99m$) and Parrot (public company). Other manufacturers include Walkera, Yuneec (60m$) and Ehang (50m$). In the software arena, the amounts of funding deployed are significantly smaller. 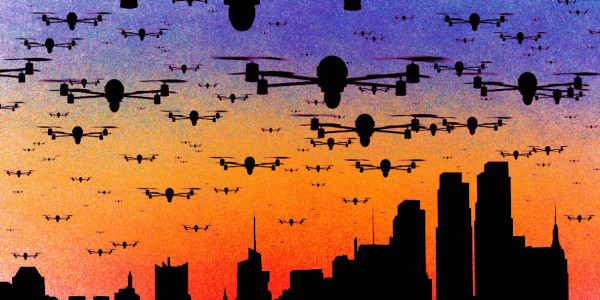 The two most relevant players are Drone Deploy (10m$), who wants to become the OS to manage commercial drones and Skydio (3m$), who focuses on making drones’ navigation smarter. Drone Base (who raised an undisclosed amount from USV) and Airstoc (NA), who provide commercial services to hire for the above mentioned industries, are also very interesting marketplace plays. 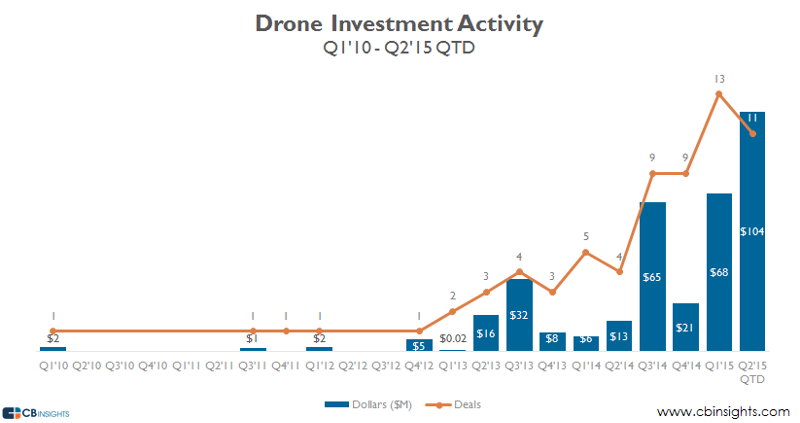 Being in such an early stage as an investment area, most VCs have done none or a single investment in drone companies. Some of the ones who did early stage bets are Data Collective, DFJ,Emergence, Felicis, First Round, Redpoint, RRE, Softtech, USV, and if I might add ourselves to that impressive list, Point Nine Cap. In later stages you can find the usual suspects — Accel, Andreessen, Intel Capital, Kleiner Perkins, etc.